In order to qualify for the major, students must have received a "C" or better in at least one lower-division anthropology course (ANTH 1, 2 or 3), and have either received a "C" or better in a second lower-division anthropology course or be enrolled in a second lower-division course at the time of declaration. The Anthropology Department urges students to seek faculty advice early in planning for the major. Faculty hold regular office hours weekly and encourage students to come in to talk about their program or coursework. Peer advisers are also available. The anthropology major incorporates the three anthropological subfields of anthropological archaeology, cultural anthropology, and biological anthropology, while providing undergraduates with a solid grounding in theory and methods. Students do not declare an emphasis or concentration within the anthropology major. All students therefore are general anthropology majors and complete the same requirements. However, students can choose to take additional courses in a specific area of anthropology while completing the upper-division anthropology electives required for the major, or can choose to take courses above and beyond what is required for the major. **Please note: The major requirements have been revised effective Fall 2016. Students admitted to UCSC prior to Fall 2016 may abide by old catalog rights or adhere to the new requirements. Please contact Molly Segale (msegale@ucsc.edu) if you have any questions about catalog rights. Two-credit courses do not count toward the 10 upper-division courses required for the major. Students of every major must satisfy that major's upper-division Disciplinary Communication (DC) requirement. Anthropology’s DC requirement aims especially at cultivating high-level skills in critical and ethnographic writing. Anthropology students will satisfy the DC requirement by: a) completing the Anthropological Theory core requirement and; b) completing the senior comprehensive requirement. Note: Each course may only be used to satisfy a single major requirement. Courses cannot be double-counted for requirements within the anthropology major. Any upper division course may satisfy an elective. Courses that have been taken to satisfy a core requirement may not be used to satsify an elective. The courses listed below do not satsify core requirements but may be used to satisfy electives. Anthropology At-Large courses may be used as electives for completing upper-division course requirements. These courses do not count as anthropological theory, sociocultural anthropology, regional specialization, or biological anthropology and archaeology courses. These courses are designed for students interested in pursuing graduate research or careers that require specialized training in laboratory methods and may be used as electives for completing upper-division course requirements. These courses do not count towards the anthropological theory, sociocultural anthropology, regional specialization, biological/medical/environmental anthropology, or archaeology core requirements. One 5-credit individual studies course (197, 198, or 199) may be counted toward the 10 required upper-division courses. You may also apply up to ten units (two classes) of upper division credit towards the major. These credits must be taken at four-year universities, through EAP, or through an approved field study program. The undergraduate director must approve each course. For more information about the approval and waiver process, see the Transfer Coursework Petition. If you are transferring any credit towards the Anthropology major, you must provide the department with an unofficial copy of your transcript(s) and a copy of your UCSC Transfer Credit Summary. Students can fulfill the senior comprehensive requirement in anthropology either by passing an advanced senior seminar (194-series course, 190ABC, or 196AB), by writing an acceptable independent senior thesis, or by passing an approved graduate-level topical seminar in anthropology. All majors, including double majors, must prepare a program of study in consultation with a member of the Anthropology Department. A combined major in anthropology and Earth & Planetary Sciences, leading to a bachelor of arts (B.A.) degree, is also offered; for that program description, see Earth & Planetary Sciencesor or find requirements for the combined major here. Students going on to graduate school should plan course schedules in close consultation with faculty advisers. Many anthropology majors whose studies emphasize archaeology have benefited from concurrent study in the Cabrillo College Archaeological Technology Certificate Program. This vocational certification program is sponsored entirely by Cabrillo College, but credit for its summer field survey and excavation component may be transferred for credit at UCSC. 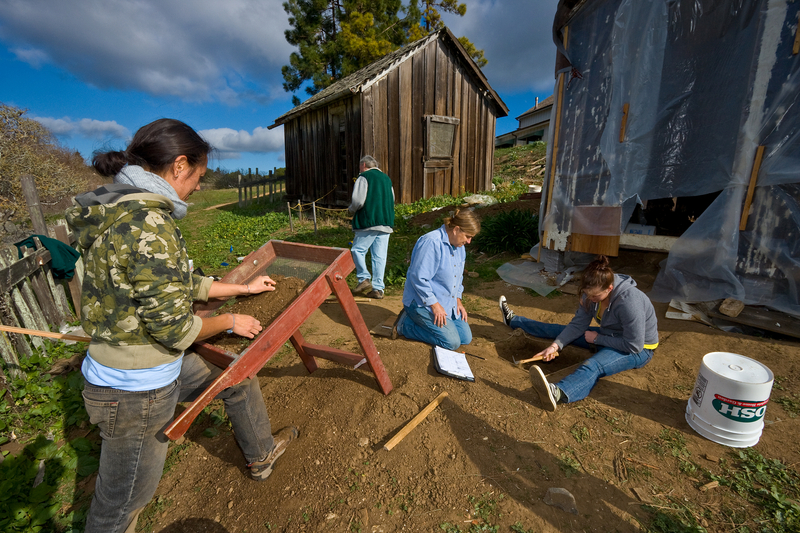 Although courses in the Archaeological Technology Certificate Program do not count toward the UCSC anthropology major, students who have obtained the certificate in tandem with their bachelor’s degree in anthropology have expanded their employment and advanced degree program opportunities. Students interested in exploring this possibility are encouraged to consult with UCSC archaeology faculty and to visit the program’s web site at http://www.cabrillo.edu/academics/anthropology/. Senior seminars are small, writing-intensive classes focusing on advanced topics in anthropology. The prerequisite for admission to a senior seminar is successful completion of courses 1, 2, and 3; senior seminars are restricted to senior anthropology majors. Note: Not all of these courses are offered each year. Students considering an independent thesis must arrange for the sponsorship and support of a faculty member before beginning research. An independent senior thesis (not written within a senior seminar) should be based on original research and reflect the student’s understanding of fundamental theories and issues in anthropology. The thesis should be comparable in content, style, and length (generally 25–30 pages) to a professional journal article in its subfield. Visit the Senior Thesis Page for more details. Students who intend to satisfy the exit requirement by taking a graduate seminar must first get permission from the department and must petition the Committee on Educational Policy. Not all graduate seminars are appropriate for fulfilling this requirement. Students who take a graduate-level course to fulfill the theory requirement may not use this course to satisfy the exit requirement.